David Zucker Wants to Reboot “Naked Gun”!!! David Zucker, who is the man behind the first two “Naked Gun” movies and the most recent “Scary Movie 5” is now wanting to reboot “Naked Gun”. He believes that it is time that the younger audience gets a taste of the franchise. He is quoted in saying that he, ”knows actors who are not famous that could play it straight like Liam Neeson” With Paramount being an international brand, there is room for the”Naked Gun” style. Leslie Nielsen played a bumbling guy in a position where he’s respected and nobody had a clue that he was an idiot. Zucker wants to do the character, but not the specific job. I am torn between it being a good or bad idea to do this. I know that with Zucker being involved it has more potential than a newer face coming in and trying to do it. The basic idea of having a character like Liet. Frank Drebin is not really a new concept. 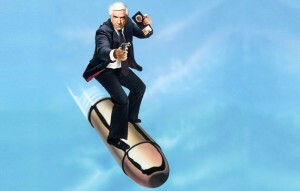 I think that its a misconception that a younger generation does not or would not enjoy the old “Naked Gun” movies. Personally, I think it could be a good reason to make some money. This entry was posted on Monday, April 15th, 2013 at 7:21 pm	and is filed under Film, News. You can follow any responses to this entry through the RSS 2.0 feed. You can skip to the end and leave a response. Pinging is currently not allowed. « Former ‘Walking Dead’ Showrunner Glen Mazzara to Write ‘The Shining’ Prequel Called ‘The Overlook Hotel’! !